Android a majority last qtr, blackberry in freefall. A funny looking bar chart that appears to be a treemap. 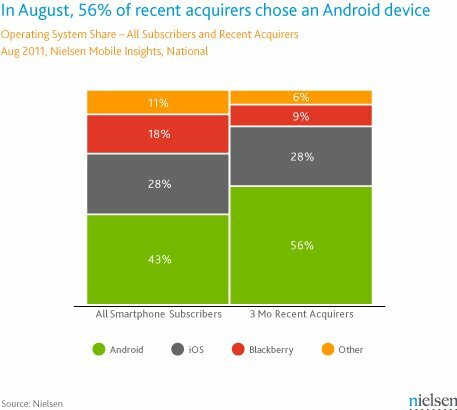 When last we checked in with Nielsen (which was earlier this month) Google's mobile OS had a sizable lead, powering just under 42-percent of smartphones sold, while Apple had cornered a more than respectable 28-percent of the market. In the few short weeks since, Android has seen its share grow to 43-percent. More interestingly, of the over 25,500 surveyed who had purchased a smartphone in the last three months, a whopping 56-percent chose to go with the Goog. Apple held a steady 28-percent across the board. Big G's gains came at the expense of RIM (only 9-percent of phones sold in the last three months were BlackBerries) and the ambiguous "other" (Symbian, Windows Phone 7, Bada, MeeGo, etc... accounted for 6-percent of sales). More important than choice of platform though, is that smartphone sales in general are climbing -- accounting for 58-percent of all handsets sold in August and driving smartphone penetration to 43-percent. Android powered 56 percent of smartphones sold in the last three months originally appeared on Engadget on Mon, 26 Sep 2011 21:40:00 EDT. Please see our terms for use of feeds.